This dish is a bit different from the Malay ayam masak merah we get back home but it does taste quite similar to it. Blend all the above ingredients and set aside. 1) Heat up frying pan with some oil and stir fry chicken on high heat until slightly brown and set aside. 2) Leave some oil in the pan and saute the blended ingredients and cinnamon stick until fragrant. 3) Add in onion, chili sauce, chicken, tomatoes and potatoes. Add some water and simmer until potatoes and chicken is cooked. Lastly add in some green peas or edamame. 4) Check seasoning and serve with warm rice. This is delicious! What kind/brand of chili sauce are you using? I'm your student at KS,PA kekeke! Mainet, thanks for stopping by. I used Maggi chili sauce. By the way, what is KS? I love ayam masak merah or anything masak merah. OMG!!! Your ayam masak merah is sooo delicious! This is my favourite dish. I wished i could cook as good as this one! Helluuuu!!! 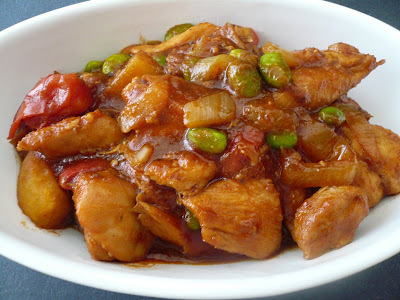 I was googling 'ayam masak merah' and found your cooking blog! I'm from Malaysia too and have been staying in Vienna, Virginia for a year plus now! =) so yeah, teringin apa2 kena masak sendiri lah right?? hehe I will try your recipe! 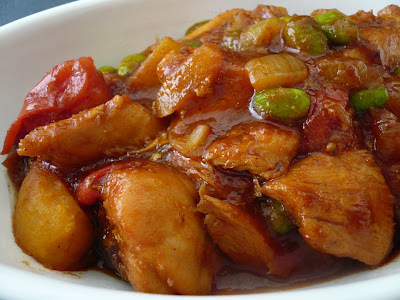 It looks similar to my friend's mom's ayam tomato which I have been craving since! thanx!